So, I’ve scrapped the zone block thing. I sat down with the info after lunch today and tried to count the blocks/plan ahead/etc. and quickly decided I just don’t have the motivation to learn something new right now. I’m sure it’s easy and I’m sure it would likely be easier than what I’m already doing, but I just don’t have one inch of brain space to spare right now. I don’t know why I have a tendency to want to add new things to my life when I’m overextended and ready to kill myself. I’ve been on my own all day since Jon has some work stuff going on, so my meals have been quick and easy. No breakfast because I just didn’t feel like dealing with it. I don’t think I drank enough coffee, either, because I’ve had a headache all day. I’m trying to cut down because I want to quit altogether, but again with WHY DO I DO THIS adding stress to an already stressed state? I sometimes freak out about my teeth being stained from the coffee … but eh. I think I’d rather drink it through a straw than give it up at this point. 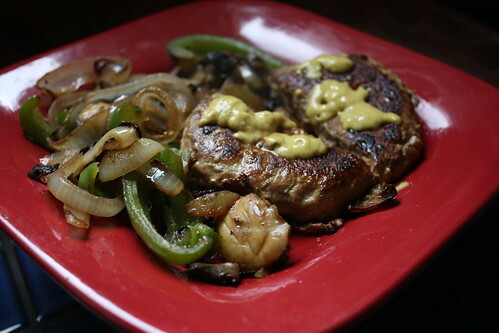 I found a frozen turkey burger in the freezer, so I cooked that with onion, bell pepper and mushrooms … and put some spicy mustard on top. 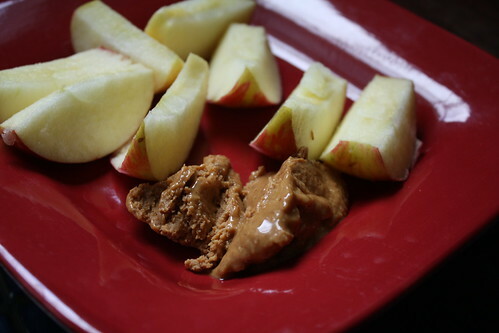 I had a snack sometime mid-afternoon – a small honeycrisp apple and some PB. 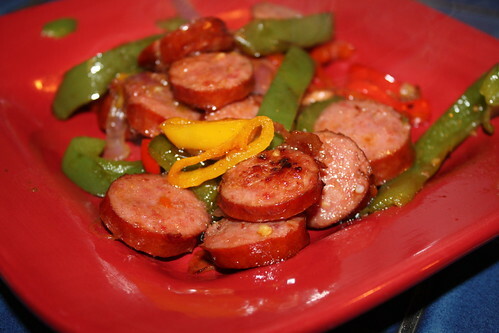 Dinner was sausage and peppers – the easiest meal I know how to make. I waited to eat it too late in the day and missed the sun. My dessert? 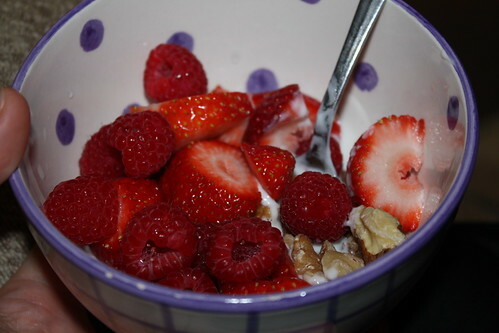 Yogurt, strawberries, raspberries and a few walnuts. I’m hoping to make it to the gym tomorrow morning at 6AM. Not sure it’ll happen, but I’m going to try. A year ago today, we hiked 11 miles. I guess I was about 20 pounds heavier than I am now, but I feel like my fitness level was higher/better. I feel like I was more focused then. I WAS more focused then. Still can’t believe it, though. Forget about the Zone 🙂 It’s great you are in a relationship where you both motivate each other to get in shape..that is a huge thing!